Actors Ricky Tomlinson and Joe McGann joined hundreds of fans by starring in a film made to protest about Liverpool FC owners Tom Hicks and George Gillett. Screenwriter Mike Jefferies asked anyone who wanted to vent their anger over the club's controversial owners to come to the Hope Street Hotel earlier. 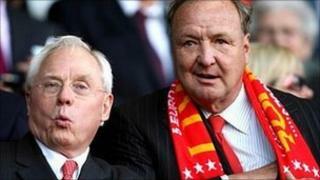 Many fans feel the pair have mismanaged their club, which is £237.4m in debt. The film, featuring fans giving their point of view on camera, will be posted on video-sharing website YouTube. Lifelong Liverpool fan Rich Davies, 31, from Aigburth, was one of the fans at the filming. He said: "Before I went in I hadn't planned what I was going to say, but when I got in front of the camera I felt quite emotional. "I didn't realise how much this had affected me." He added: "As I was saying 'Hicks and Gillett get out of my club! ', I realised tears were streaming down my face. "There was a strong feeling of defiance. We all wanted to say our piece." Liverpool FC chairman Martin Broughton, appointed in April, has been tasked by the current owners with finding a buyer, but fans claim that Mr Hicks and Mr Gillett will put their financial interests ahead of the club's in seeking a new owner. Mr Gillett is reported to be struggling to pay back a £75m loan secured against his 50% stake in the club in 2008 and Mr Hicks is considering buying his partner out. At the moment the club is floundering in the bottom half of the Premier League and failed to qualify for the Champions League last season. A spokesman for Liverpool FC said: "The sale process continues and our priority to find a good owner remains unchanged."